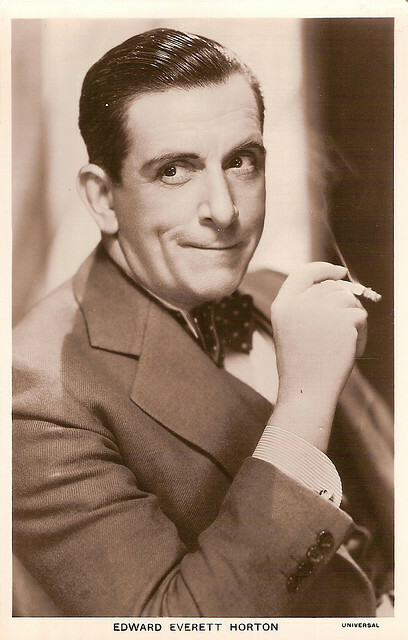 This time around we’re going with one of my favorite character actors, the amazing Edward Everett Horton. Even if you’ve never seen him in a movie, you’ve probably heard his voice — he narrated “Fractured Fairy Tales” on The Bullwinkle Show. Wow, I haven’t seen one of those since I was a kid, and I have to admit hearing Horton’s voice is a comforting thing indeed. Horton worked steadily until his death in 1970, appearing in numerous movies and TV series (including his recurring role as “Roaring Chicken” on F Troop). If you’ve never seen Horton in action, do yourself a favor and check out some of his films.